On Day 3 of the 3rd Test match at Trent Bridge stadium in Nottingham, team India set a target of 521 runs for England as Virat Kohli declared India's second innings for 352 runs. In India's 521 runs, skipper Virat Kohli contributed a stunning century and marked 23rd of his career, which helped visitors to post a challenging target in front of Joe Root and men. In reply to India’s 521 runs, England scored 23 runs without any loss at stumps on the 3 of the 3rd test match between India and England at Treant Bridge Cricket Stadium in Nottingham. English opener Alastair Cook (9) and Keaton Jennings (13) started England’s second innings on a steady note and played 9 overs in the last session of the day. Indian skipper Virat Kohli declared India’s second inning for 352/7 and sets a target of 521 runs for the English side on the Day 3 of the 3rd test match at Trent Bridge cricket stadium in Nottingham. Leading the team from the front Indian skipper Virat Kohli (103) scored a magnificent hundred with help of 10 boundaries. 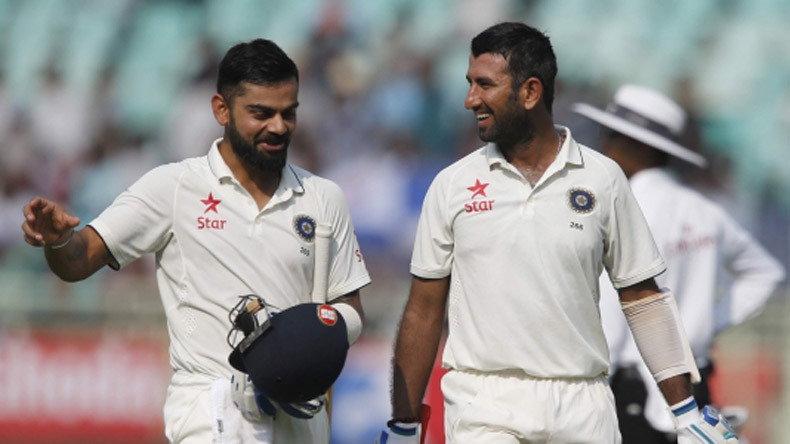 Batsman Cheteshwar Pujara scored 72 runs and build up an important partnership with the team leader to achieve a challenging total. In India’s 352 runs, all-rounder Cheteshwar Pujara, who picked up a five-wicket haul in England’s first innings, also contributed not out 52 runs off 52 balls with 7 boundaries and a sixer. Day 3’s play is currently underway and India has set a target of 521 runs for Joe Root and men. For England, Adil Rashid picked up 3 wickets and Ben Stoke dismissed 2 Indian batsmen. While James Anderson and Chris Woakes knocked 1 wicket each. Earlier the day, before lunch, only Ben Stokes and Adil Rashid managed to pick up wickets. Previous match hero James Anderson and his strike partner Stuart Broad have found themselves struggling against the Indian batsmen at Trent Bridge. On the Day 2, Hardik Pandya had wreaked havoc to the middle and lower batting order of England. The swashbuckling all-rounder dismissed five English batsmen helping the Men in Blue bundle England at a cheap score of 161. None of the England batsmen had managed to score a half-century in their first innings while the tailenders failed to reach the double figures. The top scorer for England was Jos Buttler who struck 39 runs off 32 deliveries. After losing the toss and given the option to bat first, Indian cricket team posted a healthy total of 329 runs before getting all out. Once again, it was captain fantastic Virat Kohli who led the team from the front but was unfortunate to miss his 22nd century by 3 runs. Ajinkya Rahane assisted his captain with an 81-run inning. In India’s first innings, England bowlers saw mixed success. Chris Woakes, James Anderson and Stuart Broad all took 3 wickets each while Adil Rashid had to manage with just one scalp.